Profile by Richard Gibbons: The White-throated Sparrow is a common, but striking, bird that can be seen and heard throughout Texas in the winter. This large sparrow has two color forms: white-crowned and tan-crowned. One form has bold black and white stripes on the head, while the other is closer to brown and black. Both have a bright white throat and a small splash of yellow between the eyes and bill. The females and juveniles will be more drab. If you don't spot them, you'll likely hear them with their distinct light whistle of 'Oh-sweet-canada-canada' or 'Old-Sam-Peabody-Peabody'. The regularity and abundance of this species make it a great candidate for research. One interesting discovery is that the different forms, or morphs, are maintained because each usually chooses to mate with it's opposite. Both morphs have been found to have observable differences in breeding and behavior. You'll be able to find the White-throated Sparrow at any of our sanctuaries as well as along edges of woods, thickets, pastures or in your backyard. They are ground foragers and often use both feet to scrape the dirt and jump forward on anything they've unearthed. Notes by Glenn Olsen: The White-throated Sparrow is one of my many favorite sparrows that winter on the Upper Texas Coast. It is one of the larger native sparrows, about 6 ¾ inches long with a wingspan of 9 inches. First winter birds may appear like other sparrows, brownish with streaking and difficult to identify. But the adult plumaged birds are quite distinctive with their usually bright white throat in sharp contrast to a gray breast and a black and white striped crown. The bright yellow supraloral spots are striking. One of the aspects of sparrow identification that makes them fun and challenging is that many of them appear to be very similar – generally brownish with streaking. 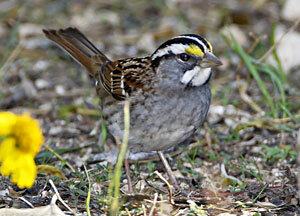 And the White-throated Sparrow has a tan-stripe form which is more difficult to identify than the white stripe form. This form is generally light brownish and lacks the high contrast of the crown and throat. This species breeds in the north-central and northeastern US and most of Canada. It winters throughout the eastern and southwestern US, arriving in Texas in October, and is common here until the end of April. 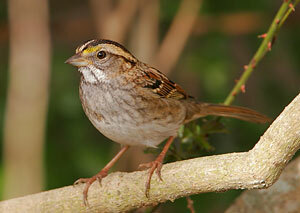 One can find White-throated Sparrows around woodland edges, woodland clearings, brush piles or in dense thickets. Our wooded county or state parks are good locations to find this species. The song is beautiful and distinctive, having a pure, loud whistle that has the mnemonic of "Pure Sweet Canada, Canada, Canada". When you hear this bell-ringing, clear song on a crisp morning it is enough to make you love sparrows.